Breathing is an important part of everyday life. We need it to live and we need it in order for our brain to function properly. Unfortunately, most people don’t breathe to their full lung capacity (5.8 L for males and 4.2 L for females). They also forget to breathe correctly all together. 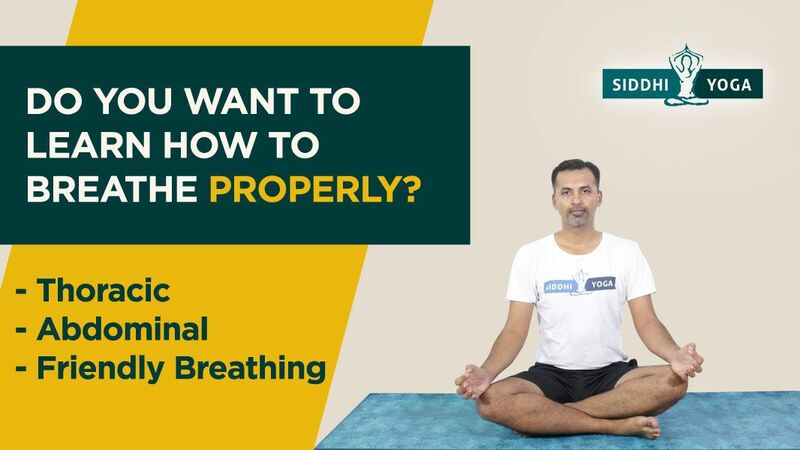 There are breathing techniques that can help teach you not only to breath properly, but also to use as much of your total breathing capacity as possible. They are yogic breathing techniques that are used within the practice. This is the maximum amount of air that your lungs can hold when they are fully inflated. It is the inspiratory reserve volume, tidal volume, expiratory reserve volume and residual volume all added up. This can vary according to age, height, fitness level and where you live. People living at higher elevations need more oxygen for their bodies and brains to function properly. This is the maximum amount of additional air that you can bring in after a normal inhalation. The volume of air that is moved in and out of your lungs during quiet breathing is tidal volume. When you are reading a book, watching TV or knitting, you will be breathing tidal volume. This is the maximum additional air that you can exhale from your lungs after a normal exhale. The air that is still in your lungs after a full exhale is residual air. When we exercise, we need to breathe in more air, which increases our total breathing capacity. It can actually increase as much as 15 per cent during exercise in order to meet the metabolic rates that your body needs when it is exercising. Your breathing will become deeper and more rapid, which will deliver more oxygen to the brain and the bloodstream. When we practice more vigorous styles of yoga, like Hatha and Vinyasa, our total breathing capacity will increase, which will have positive effects on your body, your brain and your well-being. Breathing is when we move air in and out of our lungs, bringing oxygen in and flushing carbon dioxide out. Breathing is a natural process of being a living being. It also provides a mechanism for things like laughing, crying, talking or expressing other emotions. Lungs can’t inflate by themselves, expanding only when there is an increase in the thoracic cavity. This is done through the diaphragm as well as the intercostal muscles. When air fills the lungs, the diaphragm and rib cage expand, connecting them to the sternum, the cervical vertebrae and the base of the skull. During exhalation, all of the muscles relax and the chest and abdomen return to normal, or resting position. Most people don’t even realise how they breathe; they just do. But if people actually stopped to think about how they were breathing they may realise that they are actually doing it all wrong. Meaning they are not breathing through the diaphragm and the rib cage. According to the Mirror, most of us only use around one third of our lungs when we inhale, which can cause all sorts of health problems. Not breathing fully can lead to us feeling stressed, anxious, depressed and lethargic. It can also affect how we sleep. Feeling tired and exhausted all of the time. Having a tight neck and shoulders is also a sign of incorrect breathing, as it means that you are shallow breathing. This causes the neck, shoulders and back to overcompensate. In short, it means you are breathing through your upper chest, so your lungs aren’t reaching their total breathing capacity. A great way to tell if you are breathing incorrectly is to pay attention to where you are breathing from. If you are breathing out of your mouth, then you are not breathing correctly. Breathing should always be done through the nose. By not doing this you could be altering your heart rate and blood pressure, and increasing your responses to stress. Also check what your stomach is doing. When most people inhale their stomach deflates, while inflating on the exhale. When breathing correctly the opposite should happen. As mentioned above, the best way to breathe and increase your oxygen intake is to breathe through your nose. This will also increase your Total Breathing Capacity and allow toxins and carbon dioxide to be realised from your body. This is the action of breathing through your chest. You draw air into your chest using your intercostal muscles. Breathing into the chest allows your lungs to be fully inflated, freeing the joints in your neck, upper back and ribs. With thoracic breathing, you are not breathing through the diaphragm and filling up your lungs, everything stays within the chest. The rib cage and chest widen and lift up on the inhale, and go back down on the exhale. Place the palms of your hands on your back or on rib cage and try breathing though the back and sides of the rib cage through your nose. Feel your rib cage expand and lift up as you inhale, and close and go down as you exhale. As the name suggests, abdominal breathing is breathing through the stomach, using the muscles of the abdominal wall. This is also known as diaphragmatic breathing, and is done by contracting the diaphragm. As air enters the lungs the belly expands and then goes back down on the exhale. It massages the internal organs, can help relieve lower back pain and, is great for the immune system and digestive system. It also helps with stress, anxiety and high blood pressure. Doctors are now using it to help patients as a relaxation technique. When you practice abdominal breathing, as you inhale your stomach inflates like a balloon and deflates as you exhale. It can be practiced while sitting or can be done while laying down on your back. This is the combination of both thoracic and abdominal breathing. It is how everyone should be breathing on a regular basis to ensure maximum health and Total Breathing Capacity. It is the correct way to breath to release as many toxins and as much carbon dioxide as possible out of the body. This is the way that your body wants to breathe for maximum health and stamina. It takes time to teach your body to breathe this way, especially after not breathing like this for so many years. The more you practice, the more your body will adjust and get used to it. Eventually, this is how you will always breathe automatically. Friendly breathing is a great way to maximize your overall health, both physically and mentally. It is the correct way to breath, allowing your internal organs, your immune system and your brain to function at its maximum. Breathing this way will not happen overnight, it will take time to train your body to do it, but once it comes naturally it will improve your life. You will have more energy and think more clearly. You will also experience a reduction in stress. Watch below video for an excellent explanation on thoracic, abdominal and friendly breathing. You’ll also learn how friendly breathing benefits your overall health and well-being. Why Should I Do My Yoga Teacher Training In India?